Hart had quite the birthday week! It started with Hannah, Mike and Naomi coming down for a night to celebrate! Of course, this post starts off all about the babies... they are looking less like babies, but I can still call them that until we actually HAVE more babies! 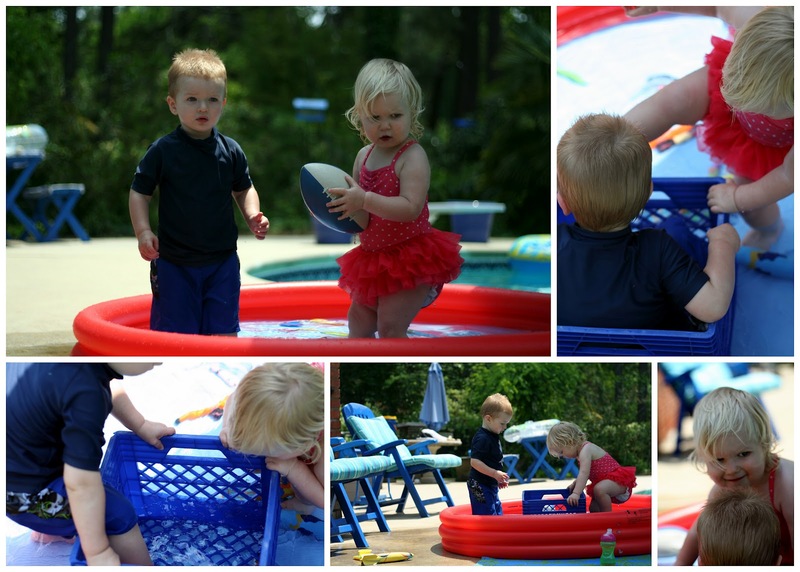 They enjoyed a kiddie pool next to the big pool and who knew a crate would be so much fun! That night we celebrated by eating a great dinner prepared by Jane and Harry for Hart! His own menu: grilled burgers with all the fixin's, sweet potato fries, and mac n cheese! I made Hart his favorite home-made German Chocolate Cake again this year, which he loved! And then he got showered with love! 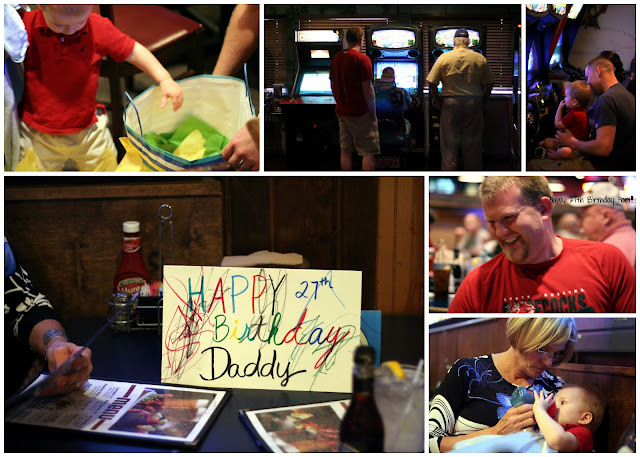 On Hart's actually birthday, this past Thursday night, we went to dinner at Carolina Wings with my family.We didn't realize that Thursday night is Trivia night at Carolina wings, so we had a BLAST playing trivia! We almost won the entire thing, but missed the final!!! Drats! Even though my brother Hunter couldn't be with us, we still called him for Trivia questions! It was so fun! And just when you thought the fun was over, Charlie, Hart's best friend threw him a surprise pizza party at work! Cai and I went and it really was a surprise for Hart! We had a great week celebrating this wonderful husband, daddy, and friend! We love you HART!!! Looking good in the birthday shirt my mama gave him!!! Wishing you many more, my love!